Is This Really the Tablet Everyone's Talking About? When all those people who pre-ordered the Kindle Fire receive their tablets in the mail this week, they will rip open their new toy’s bespoke cardboard packaging — it looks nothing like a typical Amazon shipping box — and be greeted by a playful home screen that comes personalized with their very own name. These lucky few will bask in early adopter bliss. They will issue themselves hearty high-fives for having the foresight to purchase the year’s hottest gadget, sight unseen. And then they will marvel at a device that really does bring something fresh and clever to the tablet space — namely, an insanely low price. The Fire is a fiendishly effective shopping portal in the guise of a 7-inch slate. But everything I describe above accounts for just the first five minutes of Kindle Fire use. The Fire isn’t a dud, but its real-world performance and utility match neither the benchmarks of public expectation, nor the standards set by the world’s best tablets. The Fire’s 7-inch, 1024×600 screen is too small for many key tablet activities. The Fire’s processor, a 1GHz dual-core chip, appears all but insufficient for fluid, silky-smooth web browsing, an area where I found performance to be preternaturally slow. And unlike most of its tablet competitors, the Fire lacks a camera, 3G data connectivity, and a slot for removable storage. As an assembly of physical components, the Fire lives at the bottom of the tablet food chain — and this limits what the Fire can actually do as a piece of mobile hardware. But all those consumers who pre-ordered the Fire knew this going in, right? The business press has celebrated the $200 Kindle Fire as an iPad killer — a loss-leading product that’s been priced to lure away potential iPad customers, with Amazon making back all its money (and then some) by selling untold petabytes of content from its own digital storefront. In effect: Amazon may not make margins on the tablet itself, but the Fire will catapult the company’s digital sales sky-high, and lob a Nelson Muntzian “Ha-hah!” directly in the face of Apple. But that’s a business story. And it’s a story that may have left some consumers confused. The press has lauded Amazon’s strategy to goose digital sales, but the accolades shouldn’t have been interpreted as explicit endorsements of, well, a device that people might actually want to use in the real world. I’ve been testing a Kindle Fire loaner unit for the last five days, and I’m impressed by how it elegantly repackages and streamlines every phase of the familiar Amazon purchasing experience. Indeed, the Fire is a fiendishly effective shopping portal in the guise of a 7-inch slate. It’s also a winning video playback device that uses Netflix, Hulu Plus, and Amazon’s own digital storefront to deliver hundreds of thousands of movies and TV shows, many of them free. And, yes, the Fire is pretty good bargain for anyone who’s only comfortable with cautious toe-dipping in our presently murky (and expensive) tablet waters. At $200, the Fire crosses an impulse-buy threshold — albeit a steep one — that Apple’s $500 entry-level iPad 2 can’t even approach. All these enticing features are topped off by a free one-month subscription to Amazon Prime, the company’s premium membership service. Prime provides free two-day shipping on all physical deliveries, free access to some 13,000 streaming videos, and free access to Amazon’s Kindle Owners Lending Library. This library lets you borrow e-books from a selection of more than 5,000 titles, including 100-plus current and former New York Times bestsellers — one e-book at a time, and one borrow per month, but with no pesky due dates. In total, Prime alone would seem to justify a Kindle Fire purchase — if not for the fact that the service is open to all Amazon customers for just $79 a year. This means one month of free Amazon Prime access is just a $6.58 value-add for anyone who buys the Kindle Fire. All of which leads us back to what the Fire can actually do as a day-in, day-out mobile workhorse. 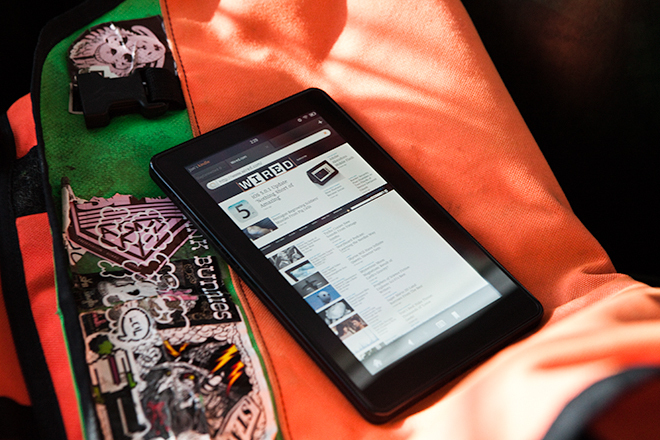 Is it tablet that people will grab again and again for web browsing, book and magazine reading, casual gaming, and more? No. It’s not that kind of tablet.